Pakistan Telecommunication Corporation Limited (PTCL) held a seminar on “The Power of Public Cloud” at a local hotel in Karachi, which was largely attended by CIOs, CTOs, and senior IT professionals from business and corporate sector. Dr. Daniel Ritz, President & CEO, PTCL was the keynote speaker on the occasion. Speaking on ‘The role of PTCL in the Digital Transformation of Pakistan’ Dr. Daniel Ritz stressed upon the urgency to bring state-of-the-art technologies and solutions for digital transformation of the country. He added that PTCL’s Cloud Infrastructure would fulfill the vision of leading the country into a new era of digitization. Ghazanfar Ali, Country General Manager, IBM Pakistan & Afghanistan, also spoke on the occasion on PTCL and IBM cloud partnership and bringing the country at par with global competition. 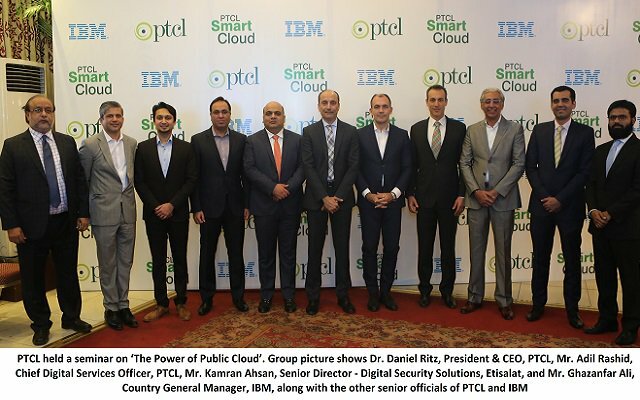 PTCL’s General Manager for Digital Services, heading the PTCL Smart Cloud segment, Nabeel Amjad gave an introduction of PTCL Smart Cloud Infrastructure capabilities and its service offering. Gustavo Alvarez, GTS Service Line Leader, IBM Middle East and Africa talked about the importance of Cloud in today’s digital age. Kamran Ahsan, Senior Director, Digital Security Solutions, Etisalat, emphasized on the importance of Digital Security in the growing world of digitalization. Public Cloud Infrastructure, Platform and Software services is an area that has exponentially grown globally over the last few years as it provides access to IT Data Center infrastructure and services at significantly lower capital and operational expenses. PTCL has been at the forefront for introducing ICT related services in Pakistan and decided to implement a local Cloud Infrastructure in 2017 as part of its continued commitment to technology and innovation. PTCL, leveraging its strong position and vast experience in Data Center hosting services, having state of the art Tier-3 Certified Data Centers and provider of high-speed connectivity solutions, launched cloud services with innovative offerings using enterprise grade platforms. PTCL has collaborated with IBM as the lead partner and system integrator for deployment of its cloud infrastructure. PTCL launched Smart Cloud in 2017 and over a short span, has built a satisfied clientele that has transformed and powered up their growth with PTCL Cloud services.